Whether you're going out for a drink with the guys, knocking work out of the park or getting ready for a date, it's important for a man to look his best. At Sport Clips, we've got you covered. Our guy-smart stylists are friendly and have training on all the latest cuts. Come in any time to our Blue Diamond location in Las Vegas, no appointment necessary for a great haircut. With awesome service, a laid back atmosphere and a game on every screen, Sport Clips is like your favorite sports bar in Las Vegas. Come in to watch football, baseball, basketball and more while one of our MVP stylists gives you the all star treatment. You can opt for different packages to experience our legendary hot towel treatment, tea tree shampoo or beard treatment. Just stop by our Blue Diamond location just outside of Las Vegas and you'll walk out feeling like an MVP, guaranteed. Not sure which style you want? No problem. Our guy-smart stylists are pros at matching men to haircuts that work best for them. They're always happy to answer your questions and show you how to style your new look at home. Whether you're a Caesar cut kind of guy, prefer a medium high-fade or just need a little off the top, you'll get a hall of fame cut at Sport Clips. We always welcome walk-ins for guys of all ages. Show you've got game with Sport Clips of Las Vegas - Blue Diamond. Sport Clips Haircuts of Las Vegas - Blue Diamond is like no other place you've ever gotten your hair cut. Sports everywhere. TVs everywhere - playing sports! And guy-smart stylists who know how to give men like you the haircut you want, and the haircut you need. We like to say, "this is not your father's barbershop!" 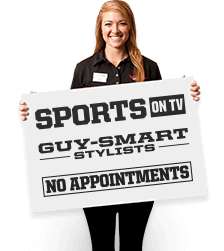 You don't ever need an appointment at Sport Clips Haircuts of Las Vegas - Blue Diamond. And you'll walk out feeling like an MVP. Guaranteed.